Patch testing is a common diagnostic tool used to identify the specific agent that triggers contact dermatitis, an itchy rash that can breakout on your skin in response to a substance to which you are allergic. Common trigger substances include poison ivy, jewelry, hair care products, cleaning solution, detergent, cosmetics, perfumes, and latex rubber. These symptoms can last for up to four weeks, and can usually be treated at home through medications and topical creams. The best protection against contact dermatitis is to identify the specific triggers that cause reactions, so that patients can avoid these substances as often as possible. A patch test may help identify the trigger. It does not require the use of any needles or injections. 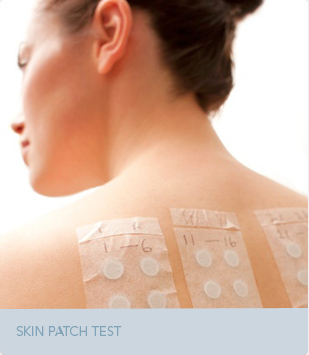 Which patch test is used at Barba Dermatology? Most dermatologists use the TRUE Test, which is a very good screening tool but is limited to testing 28 chemicals. At Barba Dermatology we offer an expanded patch testing for what is called the North American Series of Allergens, which include up to 70 allergens known to cause skin rashes in North America. We also have access to over 200 allergens and these can be special ordered for you if necessary. The patch testing procedure is simple and painless. In order to identify specific triggers, your doctor will tape several patches that contain various potential chemicals to the skin on the back. These chemicals are then left on the skin for 48 hours, and must remain dry during this time. Patients are advised to take only sponge baths and avoid excessive sweating. After 48 hours, the patch test is removed and an initial reading is taken to observe any reactions. An additional reading is taken after another 24-48 hours. Patients can bathe in between these readings, but should avoid scrubbing the back. Once the final results of the test have been read, normal bathing can be resumed. A typical schedule for testing is to come in on Monday (to apply patches), Wednesday (to remove patches) and Friday (to read results). Before undergoing patch testing, patients should stop using oral and topical corticosteroids in the area to be tested, avoid oral antihistamines, and should not expose the test area to the sun for at least three weeks.